Thank you for your interest in History at Western. We are excited for the chance to meet you and to give you a glimpse into what studying History at university is like! Please contact history-inquiries@uwo.ca to register. We have a variety of sessions scheduled throughout the day including lectures, mini-tutorials and, hands-on interactive sessions. Nazi Paparazzi: Is a Picture Really Worth a Thousand Words? 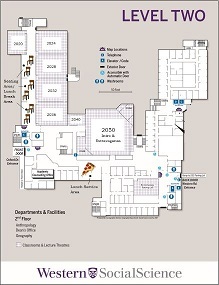 Students will attend 3 sessions throughout the day. When registration opens you will be able to select the sessions you want to participate in. The final session of the day will be a Multimedia Interactive Historical Extravaganza! Registration closes September 28th, 2018. The day will begin at 10am with a general introduction. After that, students and teachers will break into their sessions. A free lunch will be provided, as well as drinks and snacks throughout the day. Sessions will end at 1:45 to allow teachers and students to regroup and board busses between 1:45-2pm. 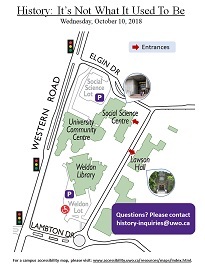 If you have any questions, please email history-inquiries@uwo.ca.